Stamp This! : Blog Hop Time! With 5 chances to win prizes! Stampendous is starting off the new year with a Blog Hop and giving away 5 prize packs! See the 5 ways to win at the bottom of my post. 1. Watercolor the background by rubbing Picked Raspberry and Spiced Marmalade inks on a long rectangle acrylic block. Spritz with water and lay the inked side down on a watercolor paper panel. Lift off acrylic block and set aside to dry. 2. Stamp images from the Whisper World Perfectly Clear Set on watercolor paper with Onyx Black VersFine Ink and emboss with Clear Embossing Powder. 3. Color with Zig Clean Color Real Brush Pens and cut out. 4. Randomly stamp circle design on the right side of the watercolored panel, glue onto a pink card and glue on the cut out images as shown with Zip Dry Glue. 5. Stamp sentiment from the Spring Sentiments Perfectly Clear Set on pink paper with Onyx Black VersaFine Ink and diecut with the Fitted Frames B Set. Glue to the top of the card. Now go comment on the other Designer's Blogs. You have so many ways to win prizes! 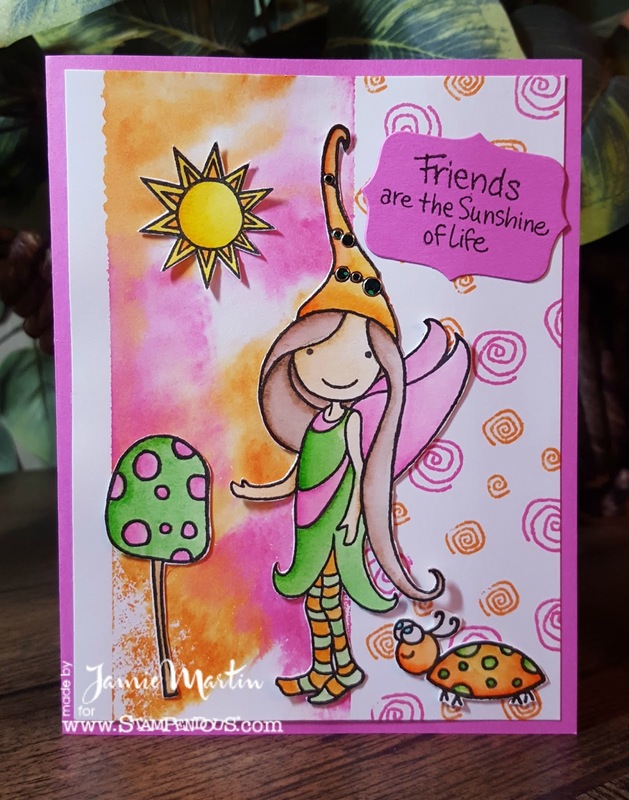 For our hop this week we are opening up to our larger community online with chances to win some new Pink Your Life stamps! Just check in with each drawing below for a chance to win! See Official Contest Rules. US winners only. Deadline is Sunday, January 22, 2017, at midnight Pacific Time. Add a comment on the Stampendous blog posts throughout this week. Each comment is an entry to win SSCP109 Whisper World Perfectly Clear Stamp Set. Find our pinned post on the Stampendous Facebook Page here and tell us in what area you live along with your comment to win an SSCP108 Whisper Happy Wagon Perfectly Clear Stamp Set. Post to your Instagram account one of your own or a favorite Pink Your Life project AND tag with #Stampendous and #PinkYourLife in your post’s description to win PLCV02 Cling Whisper Fly High and PLCP08 Cling Whisper Wall stamps. Your colors and background enhance the whimsy of the wonderful Pink girl! I love how you created the background for the little pixie. It looks gorgeous altogether. I love it!!! Thanks for the inspiration!! Very cute! This little Pixie is delightfully fun! TFS! So darling! And that ladybug ... precious! Sweet card! Love the adorable images and your beautiful coloring! Great color combo also! Beautiful coloring. Love the background. She really pops off the background papers.